The photo essay provides the photojournalist and documentary photographer with a way to tell a story in a series of images, sometimes alongside captions and/or as part of a more substantial article. The ability to successfully create a photo essay allows you to tell the story in a more comprehensive way than would be the case with an individual image. This provides the viewer with more information and the editor with more choice and more confidence in your ability to tell future stories so much better than much of your competition. The photo essay recipe that I’ve followed over the years contains the following images. A local tourist poses for a photo near a hotel on Huangshan (i.e., Yellow Mountain) in Eastern China. Commonly employed at the very beginning of a motion picture film, the opening image is a vista that provides a grand entrance into the story and helps place the viewer in a particular place and time (e.g., San Francisco during the Gold Rush, Life in Urban London 2019). The aim of this image is to introduce and entice the viewer into the event, story or theme explored. It’s helpful if your subject matter is either a vista or an iconic symbol or object as it provides the viewer with a way into the story and encourages them to further explore the people and location depicted. 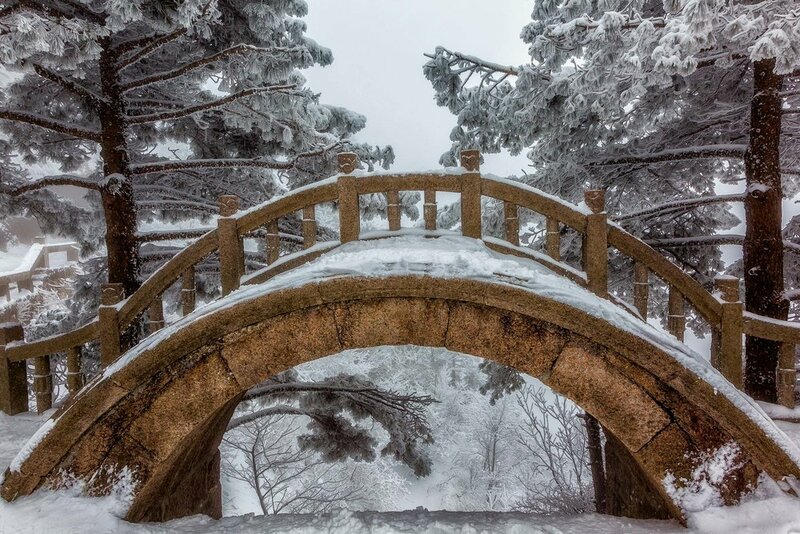 The example I've provided in this post of the classic curved bridge on Huangshan (i.e., Yellow Mountain) in China shows the viewer/reader that the story is likely set in Asia, in winter, and that it may explore historic and/or nature-based themes. Ultimately, you’re working to establish a particular atmosphere, mood or feeling (e.g., tranquility, nostalgia, stress, frenetic pace) by which the event, story or theme (rural versus city life, tourism, spirituality, environment, etc) can be successfully explored throughout the essay. While the opening image may include a signpost, the image will need to be visually interesting rather than just informative. The use of a wide-angle lens, up close, can add extra emphasize to the signpost by picturing it amongst its surroundings. Photographing from a relatively high (e.g., birds eye) or low (e.g., worms eye) point of view can also add visual potency to your image. A young woman on a path, amongst the trees, atop Huangshan (i.e., Yellow Moutain) in Anhui Province, China. There are, of course, many ways to photograph people. In the case of a photo essay we can define a people-based image as having one or more people as the key element of the image. People-based photograph allows you to explore the event, story or theme depicted and how people (e.g., characters, consumers, workers, migrants, tourists, children, old folk) interact with each other and/or the environment in which they’ve been depicted. The photo above shows a young, female tourist moving through the landscape on a high and exposed region of Yellow Mountain. It's a candid image and I love the relationship between her transient nature against that of the seemingly removable rock and trees. The cheap, plastic raincoat she's wearing and her funky boots are where the color resides and the fact that she's emerged from the mist introduces a spiritual aspect to the image. I love it! An action photo is best demonstrated with dynamic images that explore one of the many facets associated with human activity. A porter, loaded with goods, walks a windy and exposed path on Huangshan (i.e., Yellow Mountain), China. This image of a porter carrying goods across the top of Yellow Mountain is a favorite of mine as it explores the Human Condition. As there are no roads up or across Huangshan, porters are essential in carting the so called necessities tourists like me require in one of the hotels we stay at while crossing the mountain. I spent 2 days crossing the mountain, leaving on the morning of the third day. There are two cable cars up and down the mountain. I'm unsure what supplies are hauled up that way, but the only way that I witnessed goods being transported across the top of the mountain was through manual labor. Meeting those workers, on high mountain trails, was a humbling experience that certainly put my own labors, in search of great photos, into perspective. As action is an essential element in this image you should consider whether fast or slow shutter speeds will best convey the action and the mood you want to explore. 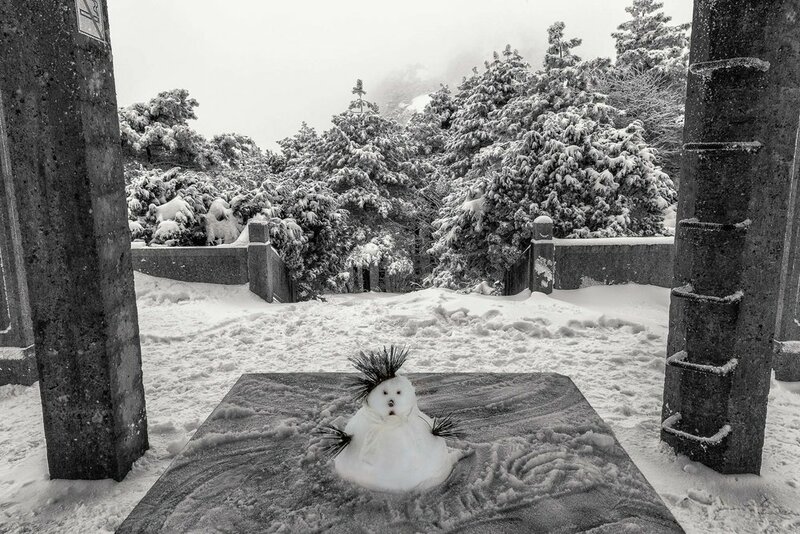 A tiny snowman under a shelter on Huangshan (i.e., Yellow Mountain), China. The detail image should directly illustrate a key aspect associated with the photo essay in question. It’s a close-up that depicts the trade, craft, art, activity or lifestyle for which the individual or region is known (e.g., nature, tourism, viticulture, saddle making, sculpture, fruit, surfing, retirement home). The detail image is an essential element in the photo essay as it can also serve to convey the photographer’s and, often by extension, the editor’s view as to the nature or theme of the story in question. A photo essay on a local winery could feature a detail of a wine bottle label, either on its own or, for example, positioned on a wooden barrel alongside grapes and a half full glass of red wine. Similarly a photo essay on farming might feature a detailed image of old, work-ravaged hands. The detail image can be relatively straightforward and objective or, alternatively, more abstract and subjective. A story on a local abstract painter might feature a close-up of a paint palette where the palette, at the end of a day’s work, might begin to resemble one of the artist's paintings. Ultimately your detail image needs to illustrate and explore the particular craft, art, sport, trade, religious practice or activity relevant to the individual, club, town, region or location depicted. This image of the tiny snowman on Yellow Mountain was fun to make. I worked in close with a wide-angle focal length so as to help place the subject in its environment. 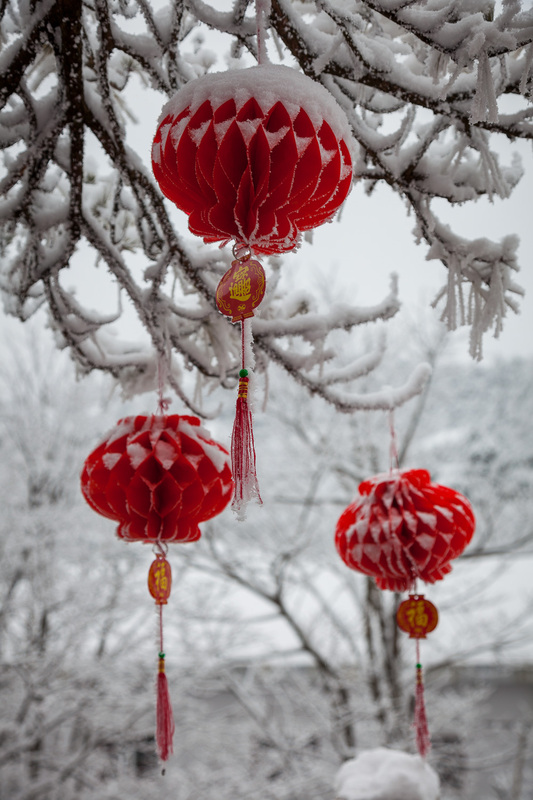 Red decorations in the snow welcome the visitor outside a hotel on Huangshan (i.e., Yellow Mountain) in China. As an aside, I think these image is a good example of how all photos, whether they include people or not, are actually about people. Photos are made for people, are experienced by people and are shared with people. 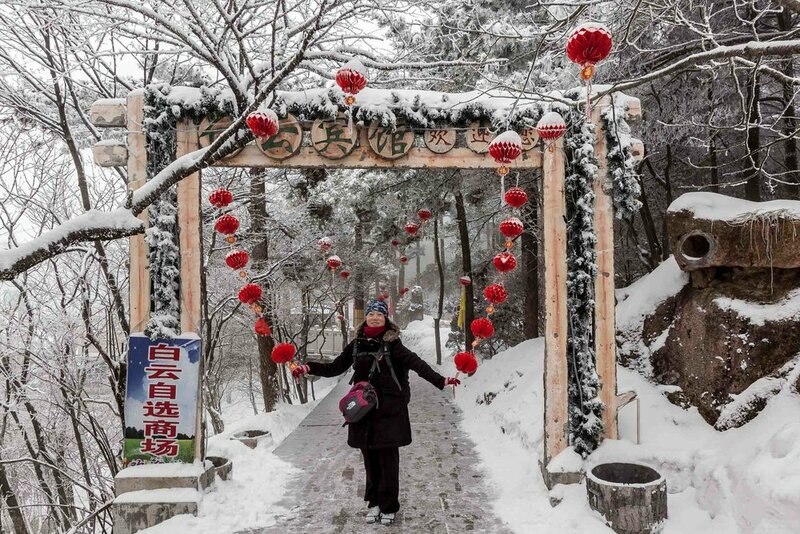 The snowman is a representation of a person (i.e., not me), while the red decorations are designed as a welcome gesture for those who have travelled to Yellow Mountain. To complete the circle I’m now sharing these images with you. A slightly more abstract example would be a photo of a dolphin. That photo is also about people, because it's people that care about dolphins and their protection. So you make photos for yourself, but you also make them for your audience. No, not dolphins, people. An alternative to photographing a subject up close is to employ a telephoto lens, used in conjunction with a shallow Depth of Field (DOF), to make a subject (e.g., an old sign) stand out from an otherwise distracting background. Of course a macro lens would also be ideal for certain kinds of details in a photo essay. For example, a close-up of a test tube in a medical research centre. 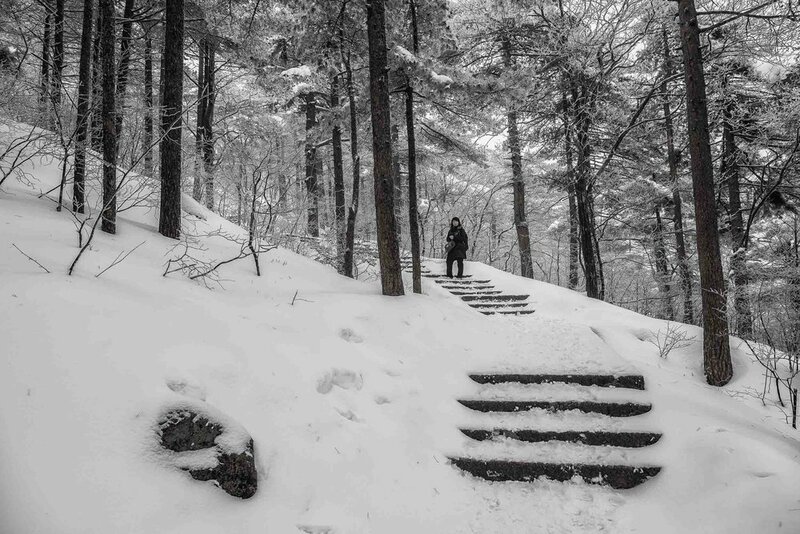 I met this young, Chinese woman on a snow covered staircase early one morning. I had just left the hotel after coming back for a shower and some breakfast after a windswept and freezing sunrise photography adventure. She was on her way to work, I assume at the same hotel. I asked her if I could make her photo and she struck the pose you see above. It's not much more than a snapshot, though I do like the rust color of her coat against the muted colors of the natural background. Likewise I wouldn't call it a powerful character-based portrait, but it is interesting to me from a cultural point of view. While it’s all very innocent the V sign in Asia stands for victory. It’s true it did previously in western societies, as is evidenced by Prime Minister Winston Churchill’s used of the V sign during WWII. However, since the sixties I think it’s fair to say that the V sign is a symbol of peace in western culture. As the form of the photo essay I’m outlining here is so well suited to commercial photojournalism the environmental portrait is usually most successful when it contains strong eye contact. You, therefore, need to stand close enough to your subject, and have them look directly towards the camera, so that their eyes are clearly visible in the resulting image. The possible exception to this is when the subject is an artist, poet, adventurer, mystic, scientist, etc., and is pictured looking out of the frame to suggest that their thoughts, vision or destiny lies outside of the confines of the world in which they are depicted. With the boundaries of your camera’s viewfinder acting as a metaphor for the world in which they live, we can see that they literally live their life beyond the boundaries of the frame. The challenge with the environmental portrait is to produce a portrait and, at the same time, illustrate the subject's surroundings. Standing around one and a half meters from your subject and employing a mild wide-angle lens, such as the 35 mm (effective) focal length, will allow you to portray the subject, relatively close-up, in a way that places them within their environment (e.g., a wine maker, with glass in hand and wine barrels in the background). Given that your subject is in such close proximity to your camera, it's usually important to ensure they are positioned off centre in the frame. Otherwise they risk blocking the environment and, as a result, limiting your ability to tell a story in a single picture. Appropriate elements, utilized as props (e.g., paint brush and/or palette, wine glass), can be held by the subject to add a sense of 3-dimensional space and identify the subject as belonging to the environment in which they are pictured. Communication is at the very heart of photography, no more so than in a well constructed environmental portrait. They say you are what you eat. I believe you are what you photograph and how you decide to approach your photography. You can tell a lot about the photographer, as a person, by looking at the photos they make. And I’m talking about our ability to determine whether the photographer in question is a compassionate picture maker or an uncaring picture taker. China's Huangshan (i.e., Yellow Mountain), is an eden of beauty, even in the depths of winter. Sometimes similar in construction to the opening/establishing image, the closing image serves to bring a sense of closure to the story. Particularly emotive imagery (e.g., silhouette, competitors leaving a sporting field with their arms around each other, first or last light in the landscape) can influence the viewer’s response and, as a consequence, their opinion on a potentially crucial or provocative issue. I made this image at sunrise on my last morning on Yellow Mountain. I set off from my hotel, along frozen pathways, in the dark without any idea of what lay ahead. Staying on the path meant I'd be safe, but what opportunities awaited I did not know. I stopped to make photos numerous times but kept pushing, up and down the step mountain paths until I found this secluded outlook, at the end of a side path, with this unbelievable view of my very own party tree. It's not Hobbiton, but it's not bad. In fact it was one of the most magnificent scenes I've ever witnessed or had the pleasure to photograph. The detail in this photo is extraordinary and, one day, I'II make a huge print of it so as to do justice to the scale and majesty of this scene. The unfortunate reality is that, even if you present the magazine or newspaper editor with all of the images outlined in this post, they may only have room for a single photo in the current edition. But who says you have to limit your images to a single publication? What's more the fact that you've presented the editor with greater choice than what they might normally be given, won't be lost on them. You might well find you hard work and diligence is rewarded, down the road, with a more comprehensive paid assignment. The lesson here is that you are not always in total control so learn to spread the risk by not limiting your options. In the commercial world you simply have to hustle. And only those that can are likely to survive. For the more sensitive among us all is not lost. But just don't give up your day job expecting that wealth and glory will follow you simply because you want it to. For most folks it's far better to think of your photography as a creative release from the pressures of the modern world. 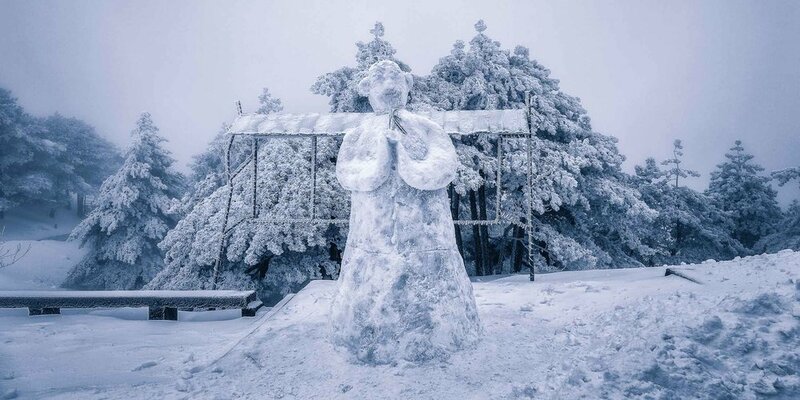 A snowman greets visitors on Huangshan (i.e., Yellow Mountain) in Eastern China. The photo essay provides a great way by which you can tell a story through a range of different images. While you might make a dozen great portraits, which could look great on a gallery wall, it’s unlikely you’ll find anyone willing to publish them, at least within the bounds of a traditional newspaper or magazine. They might work well in a collage, but that may not take up any more space on the page than a single photo. In the world of traditional publishing, you’re paid by the page, not by the amount of photos that are published. What’s more, outside of a strong and identifiable theme (e.g., the more different we look, the more similar we are), that body of work might well be considered overly repetitive. Where space is at a premium, as in a typical news-based magazine, there is almost never room for such repetition. For the enthusiast photographer, with little more than discovery on their minds, the construction of a photo essay can help you form your own initial impressions into a more substantial, expansive and, possibly, more compassionate point of view. Intuition and a sense of discovery can lead one away from the often narrow boundaries of our own day-to-day existence towards a greater understanding of life and a more life-affirming world view. Next time you have the opportunity to weave a series of images into a narrative, either on the day the photos are being made or, later, when selecting and editing images on the desktop, consider the format of the photo essay I’ve outlined here for you today.